The Texas Tone 12™ is my signature amp, the one that started it all, and my most popular model. Incredibly touch sensitve and dynamic, it has those crisp cleans and crunchy punch & pop that only a good tube amp can provide - and that you expect. Couple that with my unique, old-school, grid-bias tremolo that pulses with that "Hypnotic Slam Effect" and you have a highly portable 14 Watt combo amp perfect for Indie, blues, country, pop, and rock, whether on stage, in the studio, or at home. You want a small combo amp, with killer tremolo, that can get that sweet and creamy tube crunch without splitting your eardrums, yet still have enough clean headroom to play those clean fills? This is it. 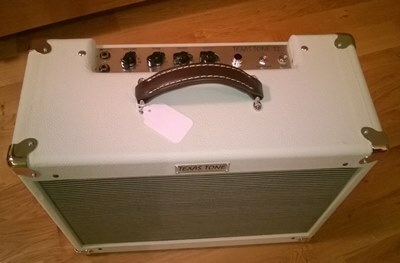 The Texas Tone 12™ exemplifies the touch-sensitve dynamics that vintage tube amps are famous for. Control your picking attack and tone and volume from your guitar, and you'll be amazed at the touch dynamics! The Texas Tone 12™ responds to your input with in a way that defines "touch sensitive". You won't have trouble finding your sweet spot! For clean, country picking, plug into the #2 input, crank the Volume and Tone to 10, and let 'er rip. For blues or rock, plug into the #1 input, and crunch to your heart's delight. Rather than the simple treble cut like most "Tone" controls, for the Texas Tone 12™ I use a Low-pass/High-pass design that passes more treble or bass as you turn the tone control clockwise or counterclockwise, respsectively. Sensitive yet subtle, this tone control gives you wide tonal variety without taking over your sound. The grid bias tremolo circuit is lush and wide-ranging, not harsh like optical cut-off type tremolo circuits, but rather that "Hypnotic Slam Effect" that can be activated using the included foot switch. The Texas Tone 12™ features deep bass response and shimmering highs without being muddy or ice-pick harsh. Break-up is easily controlled via the guitarist's attack on the strings and judicious use of your guitar's volume and tone controls. From clean to dirty, this amp allows you to remain in control of your sound. Jazz, country, blues, or rock, you'll be surprised at the variety of tones you can achieve with this amp. Speaking of sound, when you play, you want to hear the sound of your your guitar- not unwanted noise. Towards that end, the Texas Tone 12™ uses shielded input cables and a distributed grounding scheme to eliminate unwanted noise and hum from both internal and external sources. High voltage filtering is increased over traditional tweed-type circuits to provide a lower noise floor and a tighter bass response (A tube rectifier still allows for that creamy, compressed distortion that you've come to love from vintage cathode-biased amps). You'll want to see the power on light to verify that the amp is turned on! For more information or to place an order, please visit my Reverb Shop, or send me an inquiry. 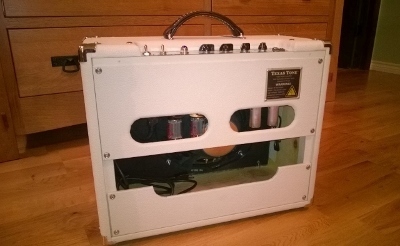 [I] installed a Jensen Vintage Ceramic C12Q last year in a 5e3 kit amp. I tried other speakers to include small plug magnet alnicos. But the sound of the C12Q works the best for all volume levels of this amp. I tried the more powerfull ceramics and they sounded muddy at lower to moderate volumes. The light weight alnicos sounded too thin and had no punchy bass. IMO The C12Q is just right for all volumes and it realy handles the higher volume crunch very well: No flubby bass, and no crackling... the C12Q does better than more expensive speakers in a 5e3. Back to Texas Tone Amps home page.